« Man in space! The painter of space hurls himself into the void! ». 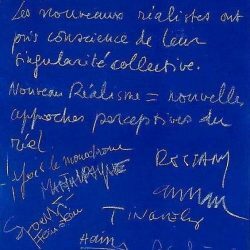 This is Yves Klein’s rather flamboyant caption for the now famous photo-collage in which he is captured blissfully flinging himself into the void at Fontenay-aux-Roses. 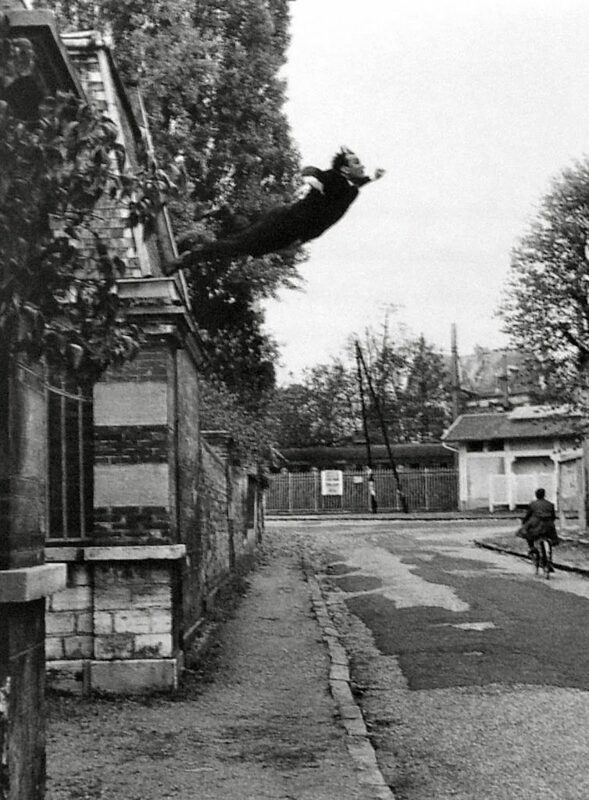 On the 27th November 1960, the artist revealed his exploit, frozen in full flight by the camera, on the front cover of a dummy issue of Dimanche. He wrote: « To paint space, I must put myself on the spot in space itself. [The painter of space] must go there himself! ». Even if the tarpaulin that broke his fall was not shown in the shot, the artist definitely took the leap. 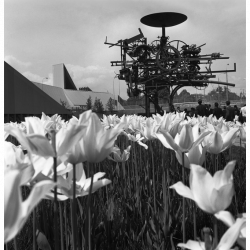 He threw himself into the void and physically experienced the sensation of space that he worked on in his art, especially in black and white. The group of friends who became the New Realists were marked by their « collective singularity » – meaning that they were together in spite of, or perhaps because of, their differences when exploring this new relationship with the world. 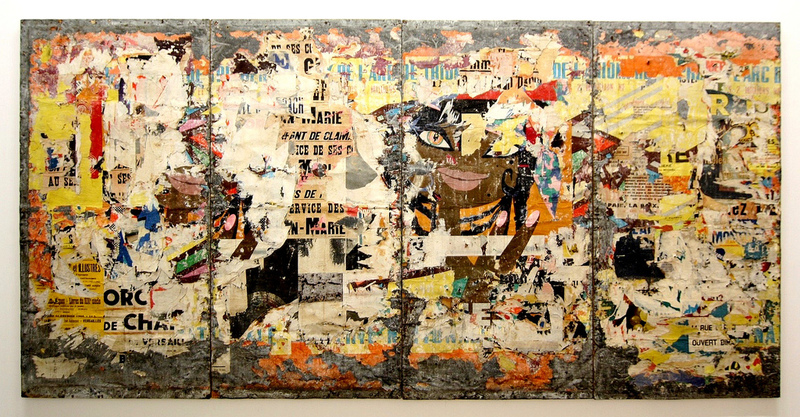 Daniel Spoerri dubbed himself a « stage director of objects ». His « picture-traps » snared objects found in chance positions in real life. Christo wrapped objects from daily life such as Yves Klein’s motorbike, subsequently rendering the object useless. 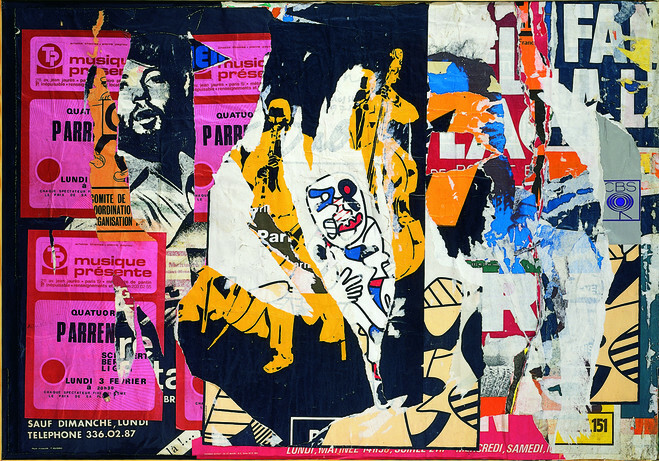 Raymond Hains and Jacques Mahé de la Villeglé scoured the city for street ads which they took/ripped and re-exhibited as works of art. 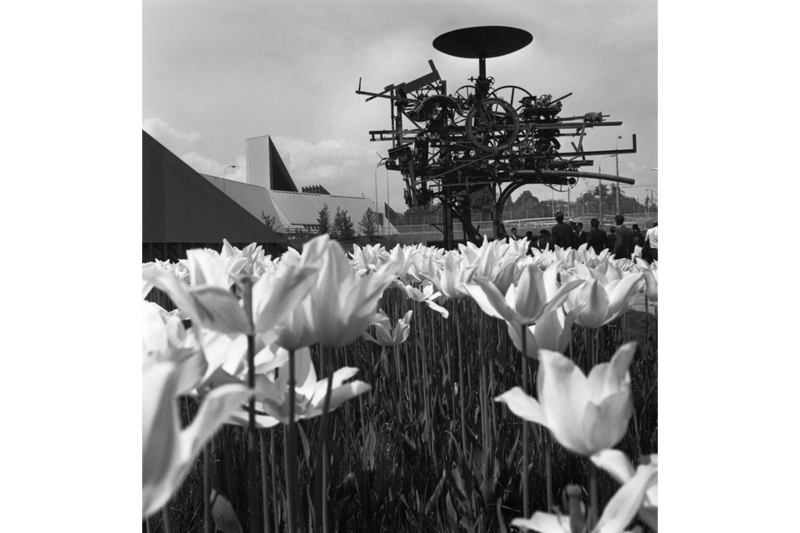 Tinguely created sculptural machines – often on a monumental scale – including replicas of objects with a twist that were both an ode to, and criticism of, industrial society. 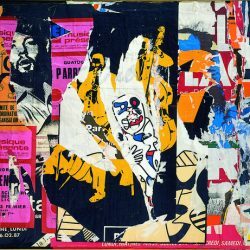 If « New Realism = New ways of seeing the real » these artists agreed to push the classical boundaries of works of art, a trend that was to balloon and flourish in the Sixties. 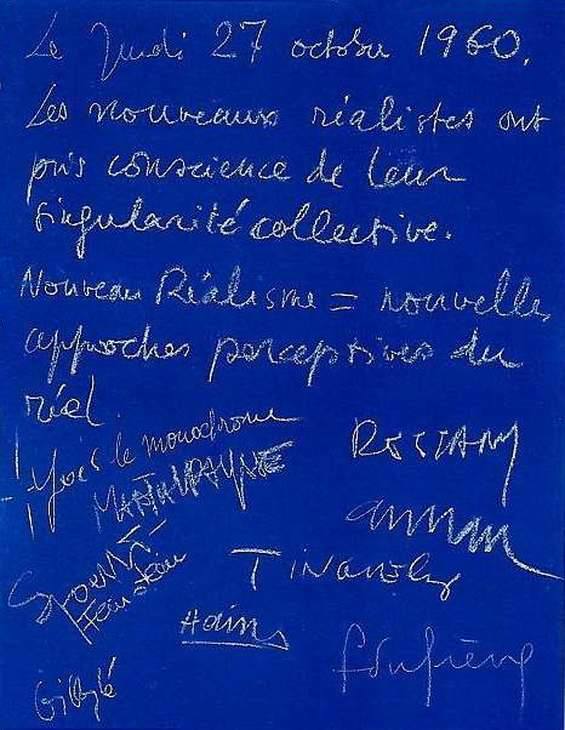 Manifesto of the New Realists signed on 27th October1960 at Yves Klein’s flat. 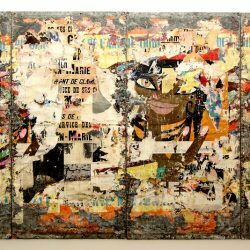 Isaline Bouchet has taught history of contemporary art at Ecole du Louvre for over a decade. She also works with cultural institutions such as CinéFabrique, Ecole National Supérieure de Cinéma in Lyon.